I mentioned to Rob that I was going to make sugar-free banana bread with spelt flour and his enthusiastic response was...crickets. Since trying said bread? He wants it for dessert. I recognize that this "Mikey likes it!" intro is a bit cheesy but it's entirely true. As a wise woman once said, a happy life is full of cheese. I can't give my husband too much grief. Not long ago, I would have turned my nose up at a sugar-free recipe made with whole grains. Countless eating experiences had wired my brain to equate sugar free and whole wheat with food that tasted fine for "healthy" but couldn't be truly delicious. Since beginning my sourdough journey, I've learned that those notions were incorrect. This bread is perfectly sweet, lets the banana flavor shine, and plays well with coffee. In this post, I cover background information on spelt, gluten sensitivity vs. wheat sensitivity as it relates to ancient grains, tips for substitutions, and some useless facts for good measure. Humans share 50% of their DNA with bananas...and 70% with slugs. This gives a new level of meaning to the saying, "I feel sluggish today." There are around 1000 varieties of wild bananas, and the Cavendish comprises 95% of the $8 billion global production (the variety most often found in supermarkets). This is a dangerous situation for the most valuable fruit in the world. The lack of genetic diversity in the crop from country to country has made it susceptible to being wiped out by fungus and disease. It's important to support local farmers and agricultural diversity. You can whiten your teeth with the inside of a banana peel in about two weeks. I found a dentist's website that explains the process and why it works. Totally trying it. There's a widely repeated Internet myth that bananas can help with depression and make you happy because they contain serotonin. Though the flavor will certainly put a smile on your face, the serotonin in bananas doesn't cross the blood-brain barrier per the Journal of Psychiatry & Neuroscience. This banana bread recipe is very easy - no need to use a mixer or any fancy techniques. I can pull the batter together in about 15-20 minutes and then it's just a matter of waiting patiently while the tea cake bakes and cools. And boy is this an efficient and satisfying breakfast. 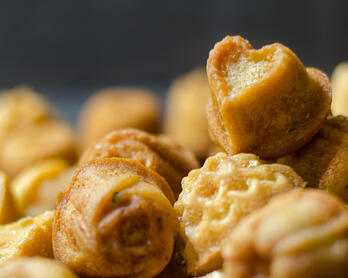 Slice off a piece, give it a spin in the microwave for 8 seconds, then add a small swipe of quality butter. Yum! 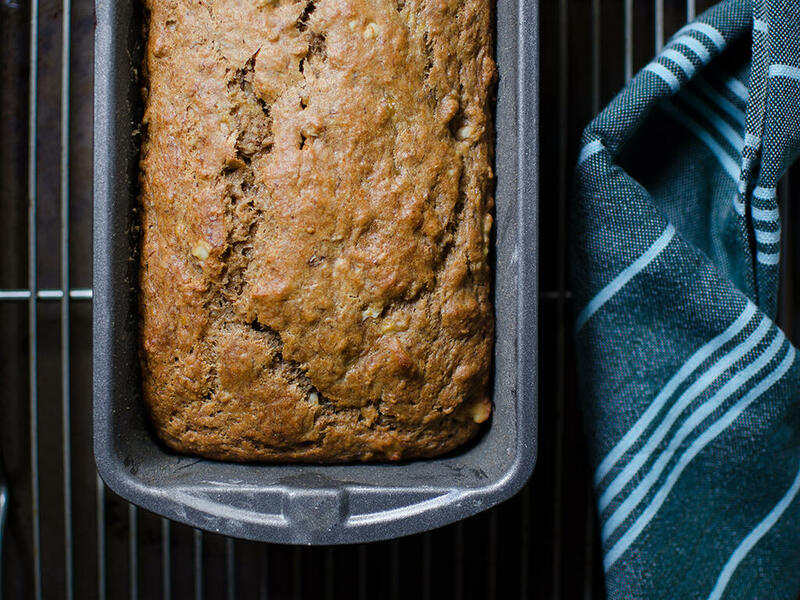 What's the difference between banana tea cake and banana quickbread? The most reasonable explanation I found suggests that tea cakes and quickbreads aren't mutually exclusive. Both rely on a leavening agent such as baking powder for structure rather than yeast or air. 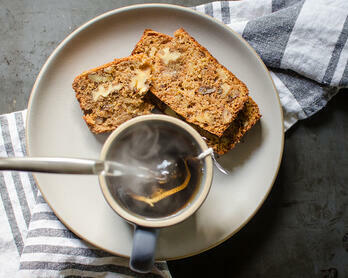 In Tartine, Elisabeth Prueitt refers to what seems to be a pumpkin quickbread as tea cake. I'm going to conclude that the recipe in this post is a banana quickbread - bread if you're stingy with syllables - tea cake if you're fancy. Humans have been cultivating spelt for upwards of 9000 years. Along with many other ancient grains, spelt was nearly put out of business by modern flour production. Though a sustainable and hearty crop, spelt's thick hull (the layer that protects the germ) meant that the grain wasn't as economical from a transportation and processing standpoint so it fell out of favor. It wasn't until the 1980's that spelt started to make a comeback. I couldn't seem to find an official definition, but the general consensus is that an ancient grain is one that hasn't been modified or hybridized in the last several hundred years. Modern wheat has been modified for everything from growing height to gluten content but spelt remains virtually unchanged from the days of yore. Additionally, though modern wheat and spelt are in the same family or genus, they are each a different species of wheat. Somewhere along the way, stories of gluten-intolerant people being able to eat bread made with ancient grains like kamut and spelt turned into "spelt doesn't have gluten". The Interwebs likes a good story. Spelt most definitely has gluten and according to most message boards I read, if you have celiac disease you shouldn't eat spelt or any type of wheat no matter how ancient it is. So what's going on here? Let's break this down. There's so much misinformation about this subject that it made my brain hurt. I did my best to sort it out. Wheat sensitivity and celiac disease (aka gluten sensitivity) are two distinct issues. Celiac disease is a very real ailment for 1% of the population. Based on the number of gluten-free products, you would assume practically everyone suffered from celiac disease, right? So how did we end up with shelves and shelves of GF food? At a high level, people with celiac disease can't eat wheat be it ancient or otherwise because is has gluten. People with a wheat sensitivity may be able to eat certain kinds of ancient grains like spelt because it is a different species of wheat and is more water soluble making it easier to digest. Why are our bodies sensitive to modern wheat? Too much of it in our diet? Modifications to modern wheat? I wasn't able to dig deep enough to answer that question. One of the challenges with this topic is that there seems to be a general lack of understanding amongst the eating population with regards to what gluten even is. People shop from the gluten-free shelves to alleviate digestive ailments, etc., and when their bodies feel better it's assumed the issue was gluten. I would describe this situation as being "unconsciously competent". By default, eliminating gluten from your diet means that you eliminate wheat so the relief people feel may be from the lack of modern wheat rather than gluten. And that's where "spelt doesn't have gluten" comes in. People who believe they have a gluten sensitivity have turned to ancient grains like kamut and spelt (not realizing they're wheat and/or have gluten) and felt healthier. Apparently there are even companies who advertise their spelt products as GF, and if you go to recipe sites and search for "spelt + gluten-free" you'll get a ton of results. This is not ideal. We're all wired differently so the issue of gluten and wheat sensitivity isn't black and white. That being said, I'll summarize with the following: Spelt is definitely wheat and there is no question that is has gluten. If you think you have a gluten sensitivity but can eat spelt, kamut, etc., consider that you may actually have a sensitivity to modern wheat or specific kinds of wheat. If you see products that contain any of the above mentioned ancient grains and also has a "GF" on the package, be aware that the company is incorrectly labeling their food. How to substitute spelt flour for all-purpose flour. I've seen a few recipes that suggest you can substitute spelt for all-purpose flour in a 1:1 ratio. It's important to clarify that this 1:1 ratio only applies to white spelt. Similar to all-purpose flour, white spelt has had the bran and germ sifted out or removed. On the other hand, whole grain spelt (the kind I use in this recipe) has all the bran and bits in the mix giving it a greater capacity to soak up moisture. If I substituted whole grain spelt in a 1:1 ratio for all-purpose flour, the food I was making would likely be dry. I couldn't find a good rule of thumb for swapping whole grain spelt in for all-purpose flour. My experience with whole grains is that you have to tweak each recipe based on the flour you have since they all behave a little differently. For example, when developing this recipe, I needed to replace 10oz of all-purpose flour with whole grain spelt. To account for the thirstier nature of whole wheat, I reduced the flour to 8oz. That reduction combined with the addition of moisture from the applesauce and honey (in lieu of sugar) seemed like a good balance. I got lucky on the first try and this recipe worked out. There's not really a science to this process, it's just important to remember that if you want to substitute whole grain spelt (or any whole grain flour) for all-purpose then you need to reduce the flour, increase the moisture, or both. If you want a 1:1 ratio then try to find white spelt. How to substitute applesauce and honey for sugar. I've found you can replace sugar with applesauce or honey in a 1:1 ratio up to 1 cup. Above 1 cup, the advice I found suggested you should go with 3/4 cup honey for each additional cup of sugar since honey is sweeter. In terms of adding more than 1 cup of applesauce, the moisture is more of an issue than the sweetness so keep that in mind and adjust accordingly. I referenced Tartine, Tartine 3, and Cook's Illustrated's The New Best Recipe when developing this recipe. I cook from these books on a regular basis and highly recommend them. The number one thing to avoid is overmixing since it will make the banana bread dense. I can't emphasize this enough. The minute the flour is incorporated, even if there are one or two flecks remaining, stop mixing. While this is true for most quick breads, spelt flour is especially prone to being overmixed. Gluten development is your enemy when making quick breads and pastries (see an extended explainer in my Flaky Pie Dough recipe), and spelt's gluten molecules join up more readily because it's more water soluble. Oil the cup when measuring honey and it will slide right out. I also use adjustable measuring cups (here and the mini here) when working with honey or agave. The pristine-looking bananas you see below had a skin that was 100% dark brown and somewhat scary looking. I was actually worried they had gone too far. Turns out that bananas on the brink will make the best bread thanks to the intense sweetness. If your bananas are ripe before you're ready to bake, just pop them in the refrigerator for a few days and they should be fine. I've made this banana bread with my Honey Roasted Applesauce and then also tried using sugar-free applesauce from the store. The texture and intense natural sweetness of homemade applesauce made better bread, but either will work. If using store-bought applesauce, consider increasing the honey by an ounce-ish to add a bit more sweetness. Interestingly, I prefer the taste and texture of the bread on Day 2. Sometimes the outside of the loaf seems a touch dry right out of the oven, but once it has time to rest, the moisture and flavors really settle in nicely. Note: Everything should be at room temperature. UPDATE: I ran out of yogurt and decided to use kefir since I happened to have some on hand. That relatively small change ended up making a noticeable difference in the texture of the bread - super tender. You can still use plain yogurt if that's what the local market has, but if you have the opportunity, I highly recommend using kefir. Notes updated below as well. 3 ounces Honey Roasted Applesauce or organic sugar-free applesauce, room temperature Note: See "Recipe Notes" regarding texture and sweetness. 4 ounces (approx 1/3 cup) honey Note: See "Recipe Notes" regarding sweetness. 2 ounces kefir (1/4 cup) Note: Plain whole fat yogurt works as a substitute. The bread will be delicious but not quite as tender. Grease a 9x5 loaf pan with butter, dust with flour so it's completely covered, then turn the pan over and tap-tap-tap to remove any excess. Cut a piece of parchment paper to fit the bottom of the pan and place inside. Melt the butter then set aside. In a small non-stick pan, toast the walnuts over medium heat until fragrant, stirring once or twice to prevent burning. When cool enough to handle, roughly chop the walnuts. Note: I don't chop them up too much since I enjoy larger independent pieces throughout the bread. Preheat the oven to 350 degrees and move the oven rack to the lower-middle position. Whisk the eggs until just broken up. Sift together the flour, baking soda, baking powder, cinnamon, and nutmeg. Note: Some of the spices and bran may get caught in the mesh. Just turn the strainer over and tap the bran into the pile. Add the salt and whisk to combine. In a medium bowl, mash the bananas thoroughly with a fork. Note: Be sure to mash the bananas well. Big chunks can create weird pockets in the bread. Add the applesauce, honey, vanilla, eggs, yogurt, cooled butter, and cooled/chopped walnuts. In four additions, add the flour, scraping around the edge with a rubber spatula and gently folding until just combined. Important Note: As mentioned under "Recipe Tips", don't overmix the ingredients. As soon as the last fleck of flour is gone, stop. With each addition, I scrape around the edge, fold 2-3 times, then gently pat the top of the mixture with my spatula to "wet" the flour. Also, there's no need to wait until the flour is completely incorporated to pour in the next addition. Once the flour is about 75% incorporated and streaking through the wet ingredients, move to the next addition. Scrape the batter into the pan, smoothing the top with the spatula. The consistency will be thick and chunky. Bake on the lower-middle rack for 20 minutes. Then, move the oven rack up to the middle position, rotate the pan 180 degrees, and finish baking for 20-30 minutes until the center measures 190-195 degrees and a cake tester comes out clean. Note: I find that the banana and cinnamon smell really kicks into high gear when the loaf is nearing the 190-195 degree mark. Cool the bread in the pan for 5 minutes, then carefully invert the pan to remove the bread (taking care not to burn your hands). Peel off the parchment and finish cooling the bread on a wire rack. Note: This bread has always popped right out for me. If you find it's stuck on the sides, gently run a paring knife around the edge before inverting the pan. Once fully cooled, the banana bread can be wrapped snuggly in plastic and left at room temperature for up to 3 days. You may be pushing the texture a bit at 4 days, but it's definitely still good enough to eat. I cut a thin slice of the end off and set it aside before cutting a piece to eat. When wrapping the bread, I put the heel or end of the bread back in place to "seal" it up. No idea if I'm helping the freshness but that's what I do so there you go.